It’s been a longstanding dream of ours to ride a shark across the high seas! We know, we know. It’s a downright crazy thing to dream about, but what’s the point of dreaming if you aren’t going to dream big? We looked into and it turns out it’s not really an easy feat to accomplish. First, you have to somehow catch a shark. That’s not too hard, since those fishy guys come running any time they smell a meal. After that, you have to hop on its back, which also doesn’t seem that difficult. The last step is really the most difficult part. You have to avoid that tooth-filled deathtrap of a mouth as it tries to gobble you up as a midday snack! Yeah… we’ll pass on that horrible fate. Especially since we finally discovered this awesome costume, which acts as a great alternative to live out our dreams! 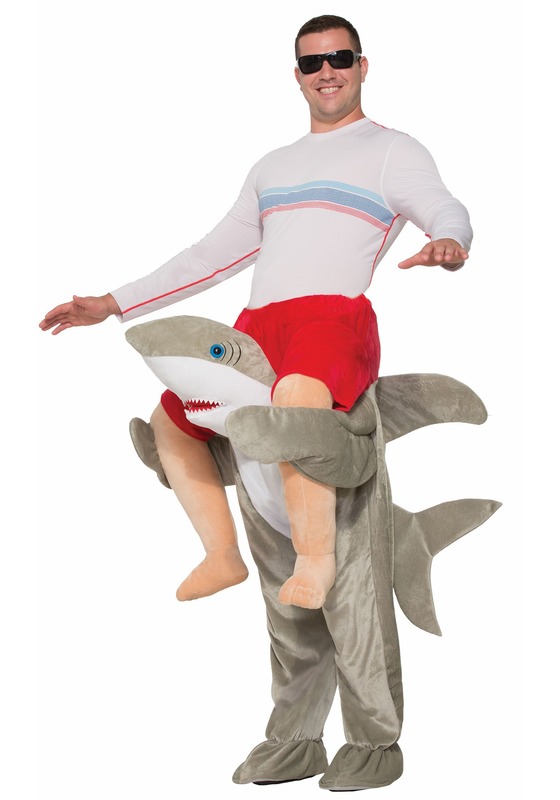 This Ride a Shark costume is one hoot of an outfit! It’s designed to make it look like you’re riding around on one of the most dangerous predators to ever swim the oceans. The bottom portion, where your legs go, looks like the body of a shark, while a set of fake legs dangle down on each side. The front has a fake shark head to complete the illusion. Once you have it on, it’ll look like you’re just chilling on the shoulders of a shark! Now, doesn’t that sound a lot easier than trying to ride on a real Great White?